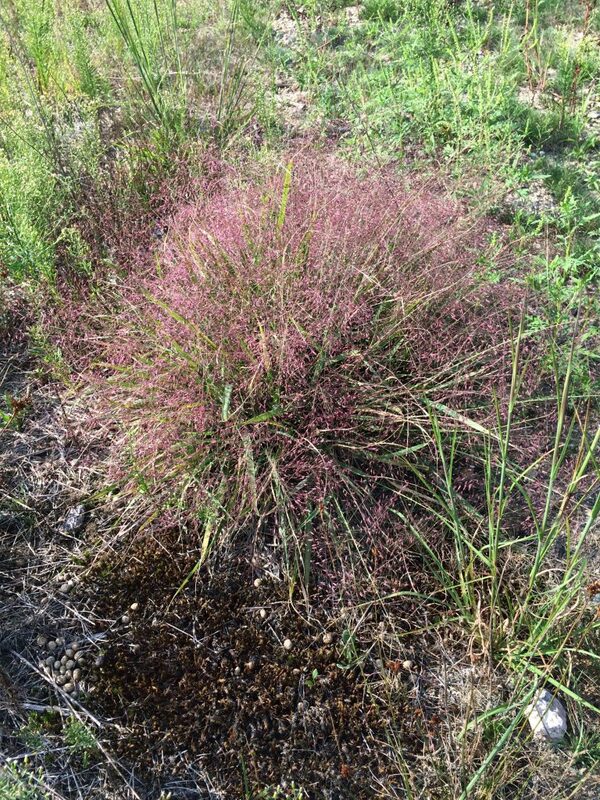 Eragrostis spectabilis is a perennial C4 grass (Wilson and Hartnett 1998; Hilty 2006) from a short rhizome, 30-50 cm, tufted, stems stiff, tough, short; sheaths overlapping, sometimes long-hairy when young, densely long-hairy at top, ligules of long hairs. 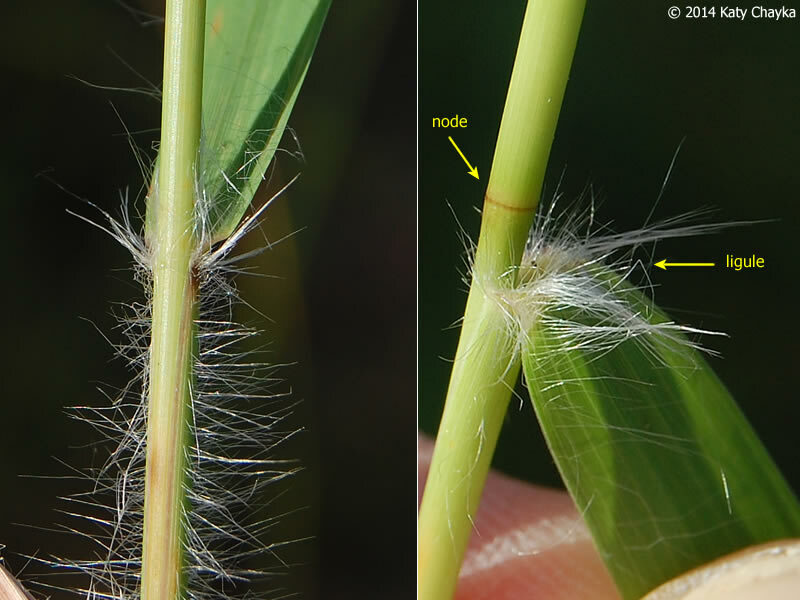 Eragrostis spectabilis sheath, node and ligule. © 2014 Katy Chayka. Minnesota Wildflowers. minnesotawildflowers.info (Accessed 5/2018). Leaves alternate, 3-4 per stem (Hilty 2006) firm, stiff, shiny, to 25 cm long, 0.3-0.8 cm wide, tapering to a point, rolling inward upon drying. 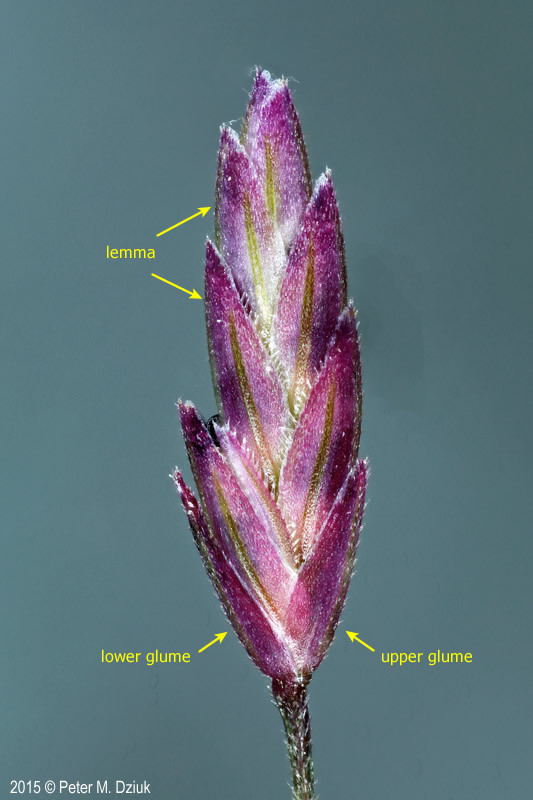 Eragrostis spectabilis spikelet labeled. 2015 © Peter M. Dziuk. Minnesota Wildflowers. minnesotawildflowers.info (Accessed 4/2015). Flower spikelets purple, 0.5-0.7 cm long, flat, 7-11 flowered; inflorescence purple, 20-45 cm long, and more than half as wide, about 2/3 of plant, diffuse, base usually included in upper leaf sheath, branches thin, open, divergent, brittle, axils with tufts of long hair; mature inflorescence turning tan in fruit, eventually breaking off and acting as a tumble-weed (Brown 1979); blooms and fruits July-Oct.
Habitat: open sites, mostly along roadsides, in dry, often sandy, soils, fill, infrequently mowed areas, soil pH 4-7.5; tolerant of drought, intolerant of fire, salt and shade (USDA, NRCS 2010).